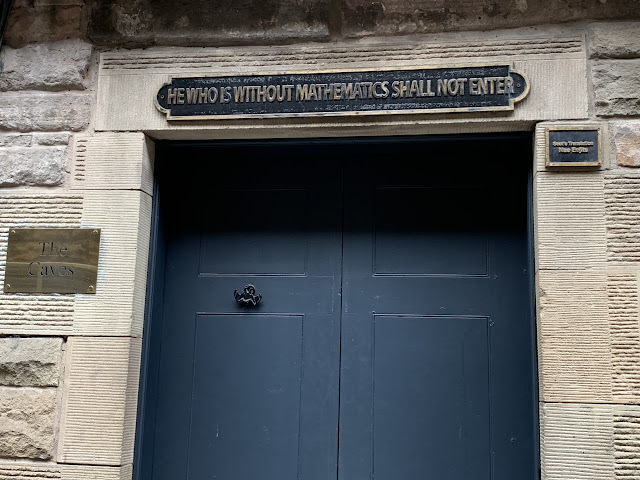 In Edinburgh you don't have to look far to find evidence of the Scottish Enlightenment and its impact, considered its birthplace, this was a period of time in the 18th and early 19th century characterised by an immense outpouring of intellectual and scientific accomplishments. As many of the Scottish upper classes relocated to London after the 1707 Union of the Parliaments the middle class professions, including lawyers, professors, architects, engineers, scientists and medical men were left to dominate intellectually in Scotland. This period of time saw rapid advancements in areas including philosophy, political economy, medicine, geology and sociology and some of the notable Scottish thinkers and scientists of the period included David Hume, Adam Smith, Dugald Stewart and James Hutton to name but a few. In the taverns, clubs and societies that were dotted throughout the Old Town these key thinkers met to debate and interrogate ideas across all fields of knowledge. Eventually the effects of the Scottish Enlightenment spread far beyond Scotland, partly because of the esteem with which Scottish achievements were held outside of Scotland and also as a result of the Scottish diaspora that was spreading across Europe and beyond. If you've read even a little of this blog or my previous Singapore one you'll likely know I love history and exploring and Edinburgh is a perfect city for doing that. As it's a pretty compact city with a somewhat kinder climate than Singapore it's also great for exploring on foot. Though if you know my Singapore blog you'll also know that a bit of heat and humidity didn't stop us doing a lot of walking around that city either. A while ago I stumbled upon the 'Curious Edinburgh' app, an app offering self guided tours around Edinburgh predominantly on the themes of its scientific, medical and technological heritage, so I downloaded it and then promptly forgot I had. Well I did remember several times but it was always when I wasn't in a position to go exploring and by the time the weekend came around or I had the time I'd forgotten about it once more. Finally though I remembered in time to actually use it. 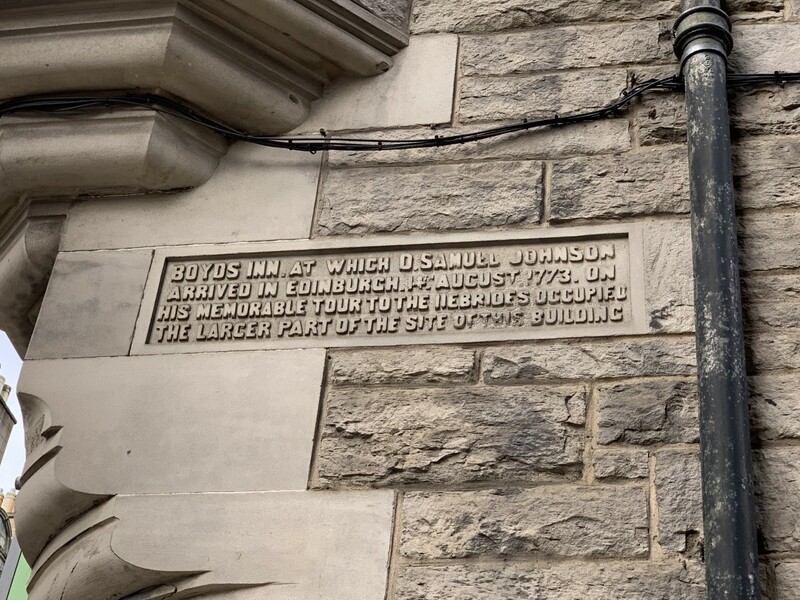 From the app's walks I chose to do the Scottish Enlightenment one as my first, mainly because I've read quite a bit about it since moving here and because this seemed a good general point to start with. I've noticed that more walks have been added to the app since I first downloaded it so hopefully perhaps still more will appear in time. It's perfect whether you live here and want to discover more about your home or if you're visiting and are looking for a way to explore at your own pace or wish to focus on a particular area of interest. As I live here I took the decision to spread the walk over a couple of weekends but it's designed for you do a whole walk in one go by foot or by using public transport if you wish. Similarly I chose to miss some parts of the walk, for example David Hume's statue as I walk past it everyday on my way to work deciding just to concentrate on the parts of it that were new to me. The app suggests a walk will take approximately three hours and that most stops on the different routes are within walking distance of Edinburgh Waverley train station and the city centre. It's well designed so that you can follow the whole route or just parts of it like I did. It's also easy to either follow the walk in the order it is on the app or in an order that suits you. Each walk has all the points marked on a handy map, which also allows you to pinpoint where you are in relation to each stop, so it's easy to get around if you aren't familiar with Edinburgh and each stop has a brief description to read usually with further links to follow if you want to find out more. Although as I said I did skip parts of the walk I actually started at the first stopping point, James Court in the Old Town. Edinburgh's Old Town is full of narrow ally ways, known as Closes and Wynds, leading off the Royal Mile connecting it to the adjacent roads. Once you know this they are great short cuts through the Old Town. Some of the buildings in James Court date from the 16th century and give a very good idea of what the crowded Old Town would have been like then. Before the building of the New Town Edinburgh was a cramped and crowded place built around the Royal Mile. Due to the lack of space the city was built up instead of out with some of the tenements rising to ten storey's or more! The rich and poor of the city lived together in these tenements with the richer people living in the upper floors and the poorer in the lower. It was to this Court that the philosopher David Hume moved in 1762 and later the biographer and diarist James Boswell with his family. Eventually, as the New Town began to take shape, many of those wealthy middle-class residents left the Old Town and its cramped conditions. By Victorian times James Court, like so much of the Old Town, had fallen into decline. It was thanks to the academic and city planner, Patrick Geddes, who moved to James Court and committed to the regeneration of the Old Town by adapting the existing architecture to create green spaces and preserve the historic buildings, that so much of what we can still see has remained to this day. From this first point the walk then takes you to a couple of places that are very well known to me so instead from James Court I went straight on to Greyfriars kirkyard to go grave hunting once again. 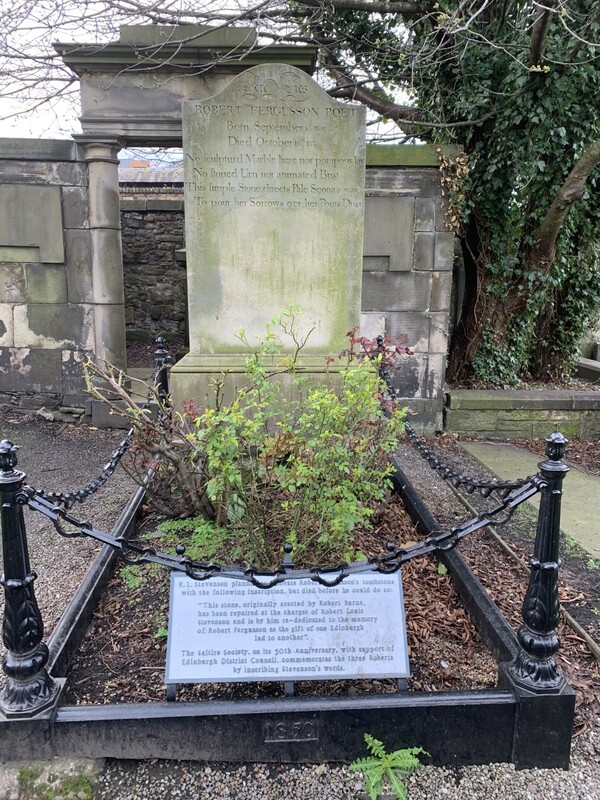 Whilst Greyfriars kirkyard is somewhere I've been to countless times and have done a fair bit of grave hunting in (take a look at this post to read about who) the grave I wanted to find from this walk was a new one for me. I was looking for the grave of Archibald Pitcairn. Luckily most of the graveyards in the Old Town have signboards listing the notable burials (there are so many) within their grounds which makes it a lot easier for visitors. Greyfriars kirkyard goes one step further though and also has a map of the graveyard indicating exactly where you can find them which really helps save time. Take note though that not every notable resident is listed, particularly those who have become famous since their death as a result of sharing their names with characters from a very successful series of books which much of Edinburgh provided inspiration for, those you will have to hunt out for yourselves. 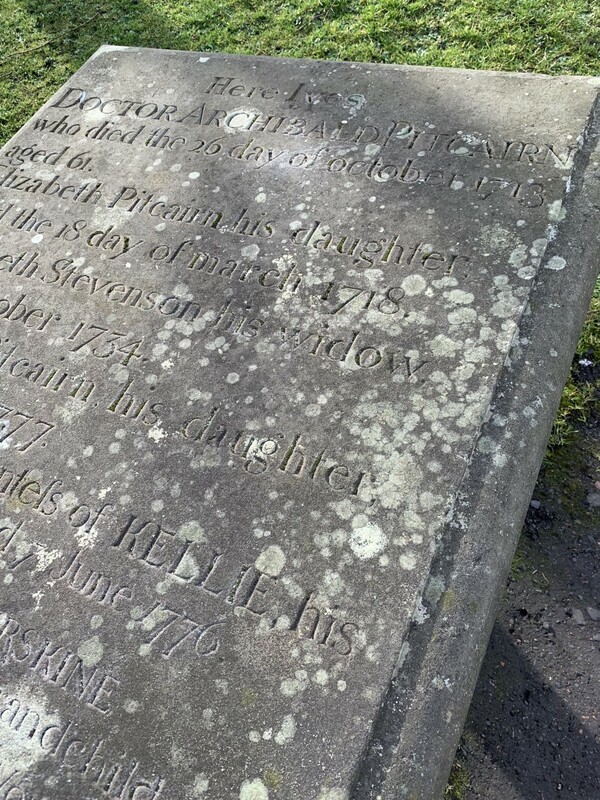 Luckily though Archibald's grave is on there so I was soon able to locate it even though it turns out that this is actually a faux grave, his real grave is in the Covenanter's prison section of the graveyard which is rarely open to the public. I mentioned above that many consider the Scottish Enlightenment to be a consequence of the Union with England in 1707 but there is also a debate around just how much of an influence it really was and for some Pitcairn is someone who proves the roots of it went back to before 1707. Pitcairn was a physician and scholar who was professor of medicine at the University of Leiden in the Netherlands. 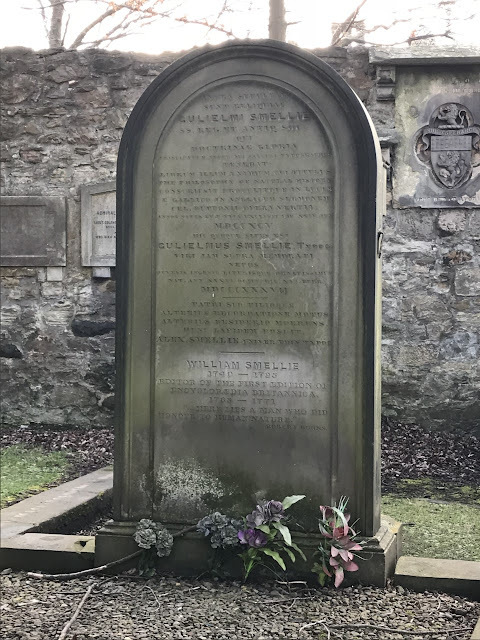 He returned to Edinburgh in 1693 where he became the first physician in Scotland doing much to lay the foundations for Edinburgh's school of medicine. He was an early disciple of Isaac Newton, playing a part in the spread of Newton's theories as well as a writer of comedies and poems. From Pitcairn's grave I was on the hunt for another at Greyfriars, that of William Smellie's. This one isn't mentioned on the handy 'where are they buried' signboard I referred to before so it took a little more finding, but maybe it's a sign of just how much time I've spent in this graveyard that from the tiny photo on the app I was able to work out roughly where it would be and found it with relative ease. Smellie was a painter, naturalist and friend of Robert Burns. He was the editor of the first edition of the Encyclopaedia Britannica, writing large sections of it though he also borrowed parts without acknowledgement from other writers works to include in it. He edited a number of publications as well as writing several books on natural history. He was nominated to become professor of natural history at the University of Edinburgh but was ultimately pipped to this post. A walk through the Meadows (the perfect place to go for a walk if the weather is good) was next which culminated with me ending up on streets I've never walked down before. After approximately two and a half years here this was quite exciting but also confirmation that we all often just stick to the parts of a place we know without ever venturing elsewhere. Proof to me as well that there is much of the city I still need to discover. The reason for heading to this part of the city though was because I was on the hunt for the site of Adam Ferguson's house in Sciennes House Place. Adam Ferguson was professor of moral philosophy at the University of Edinburgh, is best known for his Essay on the History of Civil Society and is often considered to be one of the founders of sociology. This house was where he entertained many of the leading figures of the Scottish Enlightenment. 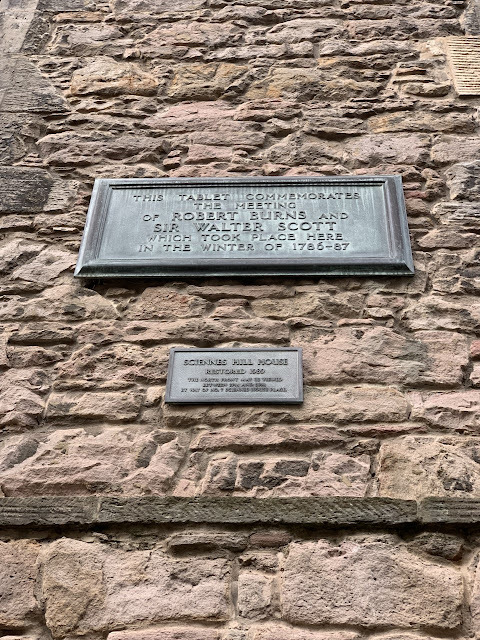 Most famously a dinner in the winter of 1786/7 where he hosted the two most prominent Scottish writers of the time, Robert Burns and a young Walter Scott. This was also the first and only time that the two ever met. Whilst I was in this area I spotted another place that looked interesting and I believe is included in one of the other walks you can follow via this app. I didn't look too closely this time and I'm not going to spoil it by naming it here but I will definitely have to go back again to that area for a better look. After that the walk took me back towards the Cowgate and parts of the city I'm more familiar with and to the site of the Oyster Club. Here at this weekly dining club was where scientists and philosophers met in the 1770s to talk art, architecture, philosophy, science, politics and economics. 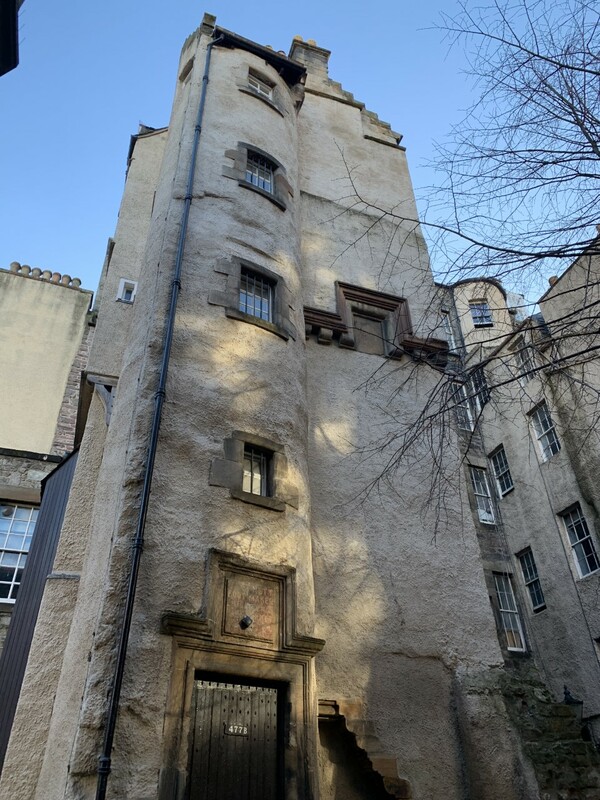 The club was attended by a who's who of the Scottish Enlightenment including David Hume, John Playfair, Adam Ferguson (who's house I just mentioned above) and many more. The location of the original club is now a private venue but it still has an interesting sign above its door as you can see in my photo above. From the site of the Oyster club it was a short walk to the next location, one that I pass almost daily on my way to work but something I've never taken much notice of previously, the site of the former Boyd's Inn. Here was where James Boswell met up with Samuel Johnson before they embarked on their famous tour of the Hebrides in 1773. The tour was done in part to prove that the works supposedly of an ancient Gaelic poet, Ossian were fake and had instead been written by the person who was credited with translating them, James Macpherson. 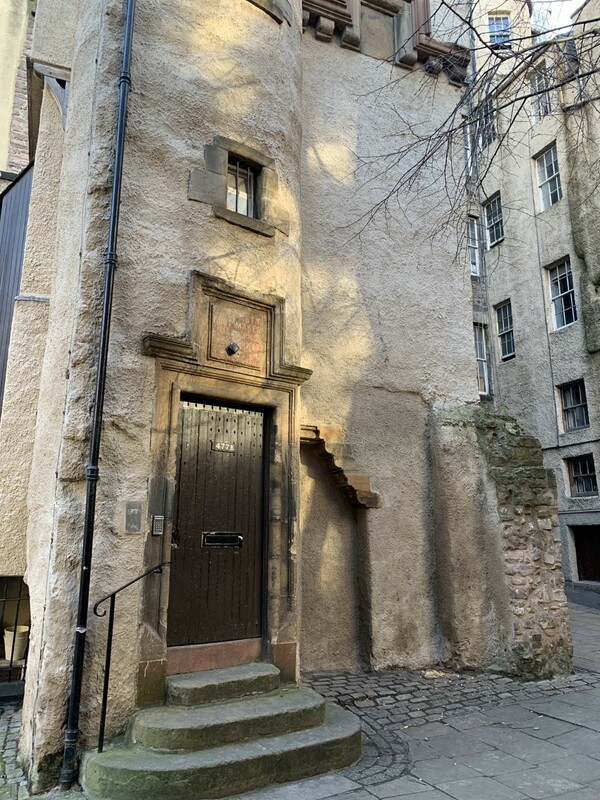 As I previously mentioned Edinburgh's Old Town is full of narrow ally ways known as Closes and Wynds with many more long since lost with the city's subsequent development. The Old Playhouse Close, another spot I pass regularly, is a significant one as the Canongate Theatre, the first theatre in Edinburgh, opened near here in 1747. 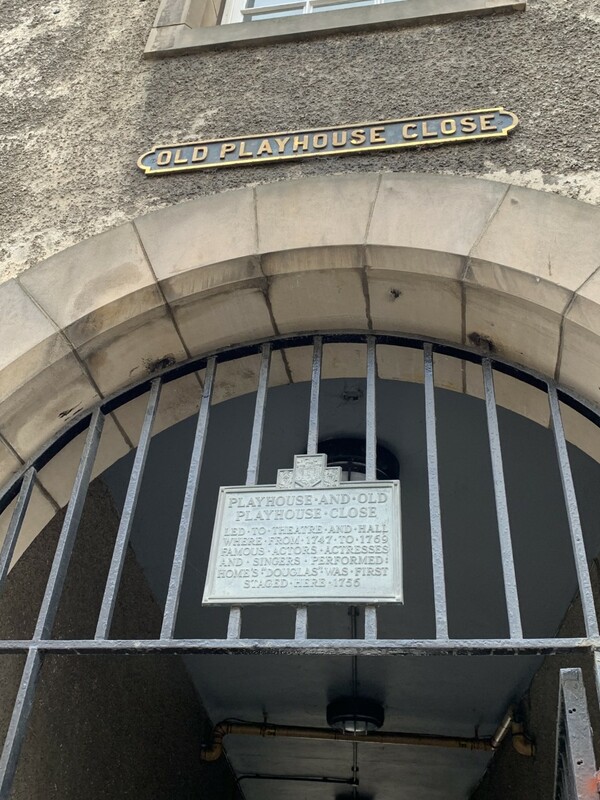 The Church of Scotland had taken a negative view of the theatre in the 17th century, the strength of this negativity evident with the story of a theatre in Glasgow being burnt down in 1752 by an angry mob encouraged by hard-line ministers. Luckily though no such fate befell this theatre and between 1747 and 1786 many performances by famous actors and singers were shown there. By this stage the walk, for me, was almost finished as I skipped over a couple more of the stops and headed straight to another of the Old Town's kirkyard's, the Canongate kirkyard. Like all of the Old Town graveyard's there are several notable graves here but I was looking for the grave of the poet Robert Fergusson who lived in Edinburgh at the height of the Scottish Enlightenment. He died at a very early age but still managed to leave a great deal of work, writing in both English and Scots, and was an influence on his contemporary, Robert Burns. He died unexpectedly as a result of a mysterious accident and it was Robert Burns who subsequently designed and paid for his headstone and also wrote the epitaph on it. My final stop was Calton Hill, somewhere I've been to many times so initially assumed I wouldn't return there on this walk, but despite this for some reason I've never really taken much notice of the John Playfair memorial sat amongst all the other points of interest there. So much so that I wasn't exactly sure where on Calton Hill it was before I arrived. 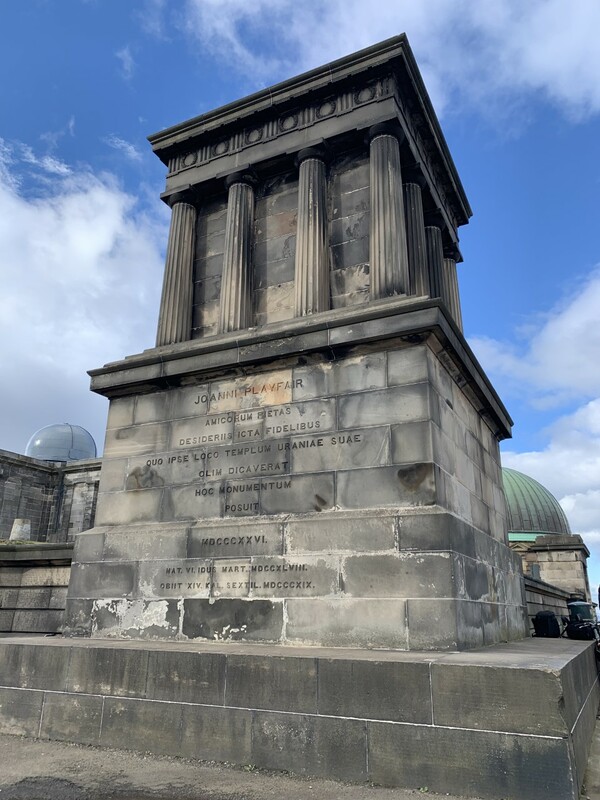 However if you approach Calton Hill from the entrance on Waterloo Place it's one of the first things on the hill you'll come too, immediately opposite the National Monument. The memorial is in honour of the mathematician, physicist and geologist John Playfair and was designed by his nephew, the architect William Henry Playfair. John Playfair was a professor of natural philosophy at the University of Edinburgh, and is best known for his book, 'Illustrations of the Huttonian Theory of the Earth' summarising the work of geologist James Hutton whose previous study of rock formations, including Arthur's Seat helped him to form a fundamental principle of geology explaining the features of the Earth's crust. With the walk officially ending at this point it was interesting to reflect on how much in the city is linked to the Scottish Enlightenment and that its links are everywhere for us to see even if we don't realise the connection. Of all the walks on the app this was definitely a good one to start with for me, though I think it helps if you know a little about the subject area already or are prepared to read up on it a bit more afterwards. I'd recommend the app whether you are here as a visitor or if you live here and I hope to do some of the other available walks before too long.